The reionization epoch ended 1 billion years after the Big Bang. Somewhere in all this mess, it is thought the first Higgs bosons popped into existence (after all, the Large Hadron Collider isn’t dubbed the “Big Bang Machine” for nothing), and then other bosons solidified, followed by inflation, symmetry breaking, supersymmetry breaking and then quark formation. All these things happened within 10-6 seconds after the Big Bang. To say the Universe sprinted before the marathon is an understatement. OK, so things happened fast during the first blink of the Universe’s existence, but things slowed from here on in. As temperatures dropped further, matter condensed into more complex assemblies allowing hadrons to form (< 1 second after the Big Bang), then leptons (< 3 minutes), then photons and atomic nuclei (> 3 minutes). Between 3 and 20 minutes after the Big Bang, nucleosynthesis was allowed (the temperature was neither too hot or too cold for nuclear fusion to generate deuterium, helium and lithium nuclei), so this 17 minutes seeded the matter that would form the building blocks of our Universe for the rest of time. From this point on, things became a little more pedestrian. Once nucleosynthesis stopped (the Universe had cooled and fusion was no longer possible), the cosmos was “all in”, it was up to the natural processes that would follow. Forces had been liberated and matter had settled into quarks, bosons, leptons, hadrons and light ions. After a long period of cooling (310,000 years or thereabouts), we start to see the first neutral atoms, as the light nuclei capture free electrons (a process known as recombination). The thing is with atoms with electron shells is that they are very efficient at absorbing and scattering photons. Therefore, the Universe became rather foggy; the darkness set in. The “Dark Ages” had begun, and it only started to get a little brighter when the first proto-galaxies (plus energetic quasars at their core) began to coalesce. Then the fun started all over again. From 150 million years to 1 billion years after the Big Bang, a phenomenon called reionization occurred, changing the state of all the matter in the Universe. 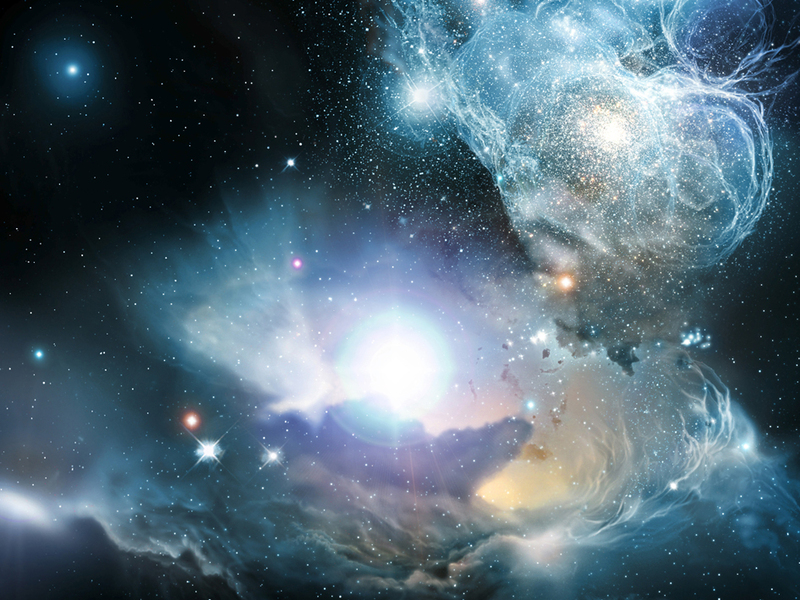 As the early quasars were pumping out so much energy inside their proto-galactic clouds of gas, it is thought electromagnetic radiation flooded the Universe, ionizing the majority of neutral atoms. Electrons were kicked out of their comfortable energy shells around atomic nuclei and the Universe was awash with ions and free electrons once more. This intense period of reionization switched the lights back on. It was as if the mist had been burned away by morning sunlight. No longer hindered by neutral atoms, photons could travel without hindrance, making the Universe close to being transparent. The majority of the Universe remains in a plasma state, so not a lot has really changed for the 12.7 billion years following the end of the reionization epoch. However, there appears to be another theory that might explain how the reionization epoch started and what drove it to ionize the majority of matter in the Universe. Although we still know very little about dark matter (apart from the indirect effect it has on the rate of Universal expansion and the spin of the galaxies), we do know that it must constitute at least 85% of the total mass of the Universe and it must be non-baryonic dark matter (apart from a comparatively small quantity of baryonic dark matter). The fact that it is non-baryonic signifies that it had no part to play in the formation of matter in our Universe. But that’s not to say that it didn’t shape the Universe as we know it. Dan Hooper and Alexander Belikov from Fermilab in Batavia, Illinois, recently published research suggesting that rather than early quasars and stars causing the reionization epoch, it was in fact annihilating dark matter that generated the required radiation to strip all atoms of their electrons. 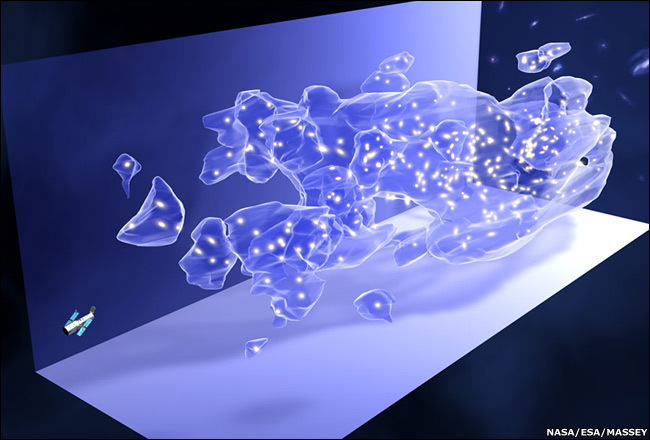 There is some opposition to this idea, as dark matter remains a cosmological mystery. Explaining how the reionization epoch was actually driven by dark matter annihilation is probably a little too far-fetched to warrant re-writing the textbooks quite yet. Although this idea will probably remain controversial for some time, it does provide another insight to how the Universe may have not only been shaped by the gravitational presence of dark matter, but it may have also provided a very potent source of gamma-radiation that reionized all matter a billion years after the Big Bang. 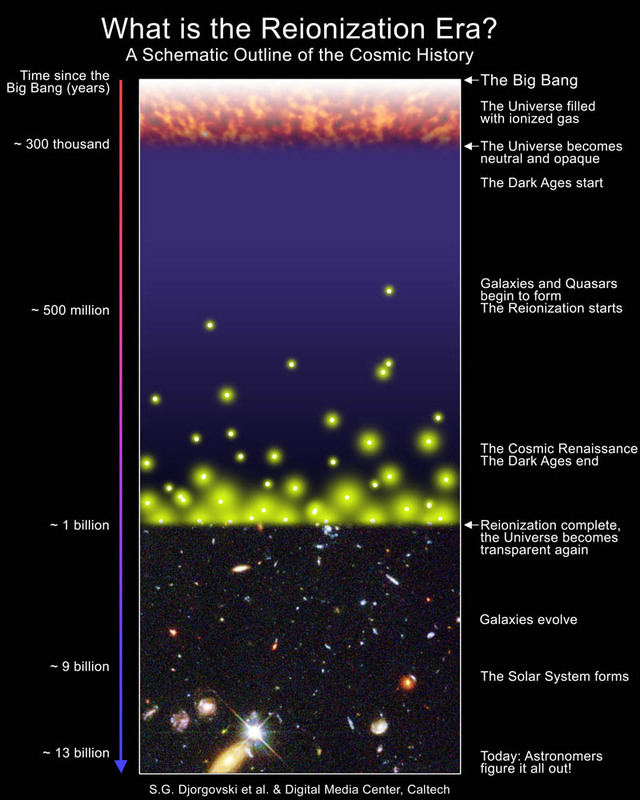 For more, check out my Did Dark Matter Annihilate Our Early Universe? article on the Universe Today. Excellent writeup, with a nice diagram to boot! I had forgotten this piece of universal history (and I believe the age estimates have changed), but hopefully it will stick this time.